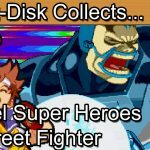 Insert Disk collects Street Fighter Collection for the Sega Saturn. Welcome to Part 7 of 11 of this Sega Saturn Capcom Fighting games mini series. We will be taking a look at all of the major Capcom fighting game releases from Street Fighter, Marvel, Street Fighter Vs and Darkstalker series. These retro gaming classics form a large part of the Sega Saturn’s lasting appeal and of particular interest to collectors of Japanese Sega Saturn collectors. 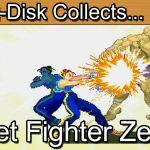 Part 7 sees the launch of the Street Fighter Collection for the Sega Saturn. Greetings collectors and welcome to today’s retro game review. You join us in part 7 of the Sega Saturn Capcom Fighter Mini series. We’re taking a look back at Capcom’s fighting games for the Sega Saturn. Expect Street Fighter. Street Fighter Cross-overs. Marvel and Darkstaklers all battling it out on behalf of Capcom. In the last episode we saw how Capcom were able to improve on the X-Men Children of the Atom formula with the stunning sequel Marvel Super Heroes. The game introduced us to the infinity gem system and also laid down an ominous message to Street Fighter that along with Vampire Hunter, Street Fighter wasn’t the only game to be evolving at the company. With excellent Street Fighter Zero and Zero 2 games in the bag for Saturn owners it was time for Capcom to fall back on their Street Fighter legacy. The Street Fighter Alpha / Zero series at the time were a step up in the opinion of many gamers. However, the 32-bit generation were in danger of becoming cut off from the roots of the franchise. 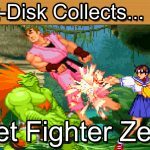 If you began your gaming career in the 32-bit era the only representations of classic characters like Guile, E. Honda and Blanka were from the Street Fighter Movie game. I think we can all agree, that was not a good place to be in. Capcom had a couple of options for fans. A Street Fighter Zero 3 release with more characters and original stages or a re-release of the classic games for the 32-bit consoles. A third Street Fighter Zero entry in the series at this stage would almost certainly been a little bit overkill. Releasing 3 sequential games in quick succession would likely have been popular with hard-core fans but for most stumping up the money for 3 Street Fighter games in 2 years perhaps wouldn’t have been the right move. The alternative would be to re-release a previous 16-bit edition of the game. Although, we’ve seen time and time again the backlash of re-releasing Street Fighter games to the point it became a joke in the late 90’s. The series is confusing enough without introducing titles such as Super Street Fighter 2 Turbo Ex Dash Zero Alpha Hyper Fighting Rainbow Edition. In my opinion Capcom made a very wise choice. 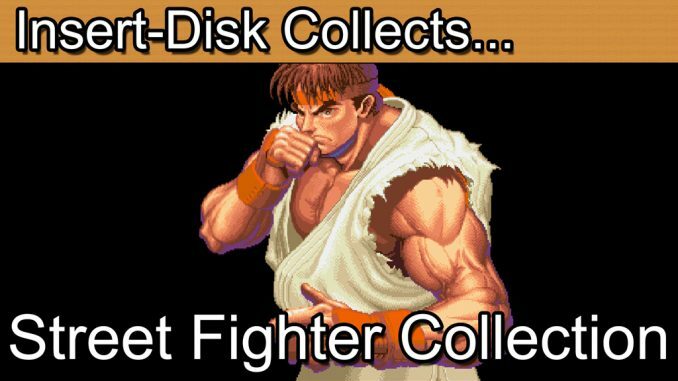 They chose to release a collection of Street Fighter games on 2 CDs, simply known as The Street Fighter Collection. I’m looking specifically at the Japanese version here and some of the naming conventions of the games contained within will differ outside of Japan. So, what do you get here exactly. 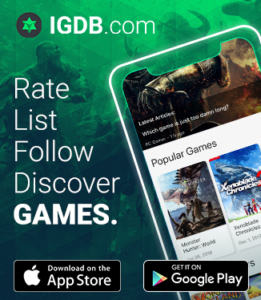 You get 3 games. On disk one, arcade ports of Super Street Fighter 2 The New Challengers and Super Street Fighter 2 Turbo (also known as Street Fighter 2 X Grand Master Challenge. 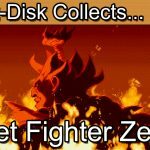 On disk 2 we find Street Fighter Zero 2 Dash. For those outside of Japan the game is known as Street Fighter Alpha 2 Gold. Essentially it’s the definitive edition of the arcade edition of Street Fighter Zero 2. Let’s start with Super Street Fighter 2 though. Out of the box you get all 16 playable characters from the arcade plus the option of unlocking characters. I have to say the game looks great and as far as I can tell this looks to be a direct port from the arcade hardware. Everything here is well animated, the sounds are crisp and I’d be quite content if this was the only game in the collection. One feature the game does omit though is the Turbo setting which is now a staple of Capcom games. This is why the disc also contains Super Street Fighter 2 Turbo. Again the game features the default 16 characters plus unlockables such as Akuma or Gouki in the Japanese edition. There’s even unlockables outfits if you prefer the classic Street Fighter look. This time around there’s a bit more content thrown in and is technically the better game. The main draw obviously being able to now select up to 4 Turbo speeds. The games are very similar. I actually prefer the menus in Super Street Fighter 2 but the added content of Super Street Fighter 2 Turbo makes is the obvious choice for most. All in all though, pick your favourite and have some fun. Right, on to disc 2. Street Fighter Alpha 2 Gold outside of Japan. Street Fighter Zero 2 Dash in Japan. For this review I’ll be just referring to it as “Dash” as I’m aware that I’ve said Street Fighter about 50 times now. Perhaps a drinking game is in order, a shot for every time you hear the word Street Fighter and a pint for every fire ball. You may remember from my recent Street Fighter Zero 2 review I very much enjoy this entry in the series. What’s here in Dash is still a great game. If I’m honest the extra touches, frames of animation and supposed enhancements are all a little lost on me. If you have Zero 2 there’s no real need to upgrade to Dash. As you might expect the game is packed full of additional extras such as the first appearance of Cammy in the Zero series. However, she is only available as an unlockable character. In the Japanese edition select Vega and beat the game and Ensure that you play well enough to gain the top score on the rankings. Once you complete the game by taking town Ryu enter your initials as “CAM”. Now when you re-enter to play highlight Vega and press the start button until Cammy becomes available. No longer in her traditional green, this is model of Cammy would be seen again on the console. More of this in the next episode though. From there you’ll be able to play as Cammy and pull off all of those great combos. There’s also another good reason as to why Capcom would want to unlock Cammy and that’s because it means you have to complete the game as Vega (or Bison outside of Japan). Completing the game as Vega means you get to see an important plot pint of the series. The creation of Evil Ryu. Essentially a souped up version of the regular Ryu but has more in common with the Gouki Akuma character. This is emphasises by the additional Gouki mode on the disc. Select this option to face off with Gouki. Be warned though, he really packs a punch and is exactly the type of challenge you need if you’re a long term fan of the series. It also pushes the narrative forward for the series. We’re in 1997 and the story of the evil versions of characters is now established and now slotted much more definitively in to the existing Vega vs. Ryu storyline. This was then expanded is several animes. It’s worth drawing a conclusion at this point that the Street Fighter Collection will keep you happy as a game. 2 great Super Street Fighter 2 variants and also the definitive edition of Zero 2. However, for Street Fighter collectors the release actually raises a few questions. In a logical world you would want to release all of the previous back catalogue in a meaningful sequential order. Here is roughly how the Street Fighter 2 universe looked by the end of 1996. I’ve distilled this down in to the major arcade and home releases although the eagle eyed will notice that variants such as the rainbow edition have been removed for my own sanity. Essentially you have the Standard Street Fighter 2 games followed by the Super and Turbo editions ending in the tournament editions. The Street Fighter collection includes the Super edition and its Turbo equivalent. This misses out many of the earlier releases. The collection also includes Zero 2 Dash which is an odd place to start. Why not start at Zero? The answer is to perhaps spread the appeal of the games to gamers. The games selected are certainly great, it’s just that as a collection it’s neither one thing nor the other and certainly far from complete. This is all a bit academic now anyway as later collections have plugged all of the major gaps. Later series such as 3, 4, 5 as well as various special editions and regional differences would muddy the waters to the point where a full review is near impossible. What I can say though is that the Saturn Collection is excellent. It’s got a little bit of old school and a good dose of modern making it the go to purchase if you were standing in front of a game shelf in 1997. Things were about to shift direction again though for Capcom. We touched on the idea of a Capcom universe unification in previous episodes. This idea was about to get kicked off its hinges by late 1997 in perhaps the most important Capcom Fighting game of the 32-bit era. It was time that two worlds collided as the first Capcom cross-over game was released. X-Men Vs. Street Fighter. A game so large it was even supplied with its own 4mb memory cartridge. Join me in the next episode as we take a look back on the beginning of the Capcom Vs. line of games in X-Men vs. Street Fighter.